Today (Monday) was a particularly tough day for me. Its laughable really, that when I started all of this, when I got on this journey, that I thought losing the weight would clear my head of the demons that made me 65 pounds overweight in the first place. That is not the case, in fact… sometimes I think it did the exact opposite, it made me acutely aware of those demons because they are no longer buried under the excess weight. And those demons aren’t the only thing I dug up. Someone told me once that I am extreme, and when she said it, I got very angry, not really understanding what she meant. As I’ve learned a lot about myself this year, I have begun to see what she was trying to say. For the most part, I think what she perceived as extreme was really just passion. When I love something (or someone for that matter) I dive in head first, give my whole heart to that person or thing. Health and fitness has been no different. When I took the plunge and decided to start exercising, I went from one extreme to another going from literally never having worked out in my life to working out 10-15 hours a week. I also went from eating extremely poorly to eating solely clean foods without cheats. Overtime, I have found ways to be less extreme, to allow myself some wiggle room but that’s not to say its not hard for me. I find that I succeed in the extremes. But these extremes are not necessarily the healthiest way to live. They force me in and out of great days and bad when it comes to food and exercise. So today, I’m making a choice, to go back to the basics that grounded me in the first place… because I feel like I need a little grounding. Here’s the thing, I can’t go back to those extremes, because they are unhealthy and absolutely not sustainable. So I have to figure out how to go back to basics without going back to extremes. I’m not exactly sure what that means yet, but I’m willing to try until I figure it out. I need to find a way to build a sustainable long term solution, and that includes facing the demons that I’ve uncovered. I’m going to start with something I know helps me, I put my fitness pal back on my phone. It’s a great reminder of exactly how quickly calories add up. And looking at all of my food laid out in front of me at the end of the day definitely makes me more accountable to my health. So, we’ll see how this goes. I’m working with trial and error here. Sometimes, I think that’s the best way for me to find what I can keep up with. I’m honestly not sure exactly what will end up working in the long run, but I’ll figure it out eventually. I guess there will always be difficult days with this. I think when I started I thought the difficult days would subside. But I’m thinking now that this is a lifelong thing. Maybe the tough days will come less often, but they will always come. 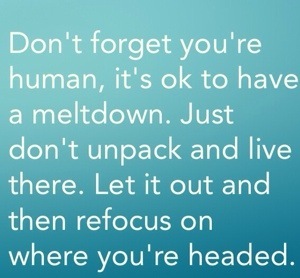 It’s about handling those days, and then moving forward.